There are a total of twenty Activity Badges which are divided into five groups of four activities each. Some of the badges are required for the Webelos Badge and the Arrow of Light Award, others are optional. The badges can be worn on the Webelos hat, however we recommend they be worn on the Webelos Colors (shown right). The rank of Webelos entitles you to wear the Webelos Colors. These three ribbons are green, red and yellow. The Webelos leader should consider using parents or other adults as subject matter experts in helping the den with activity badges. This approach is similar to the function of merit badge counselors in Boy Scouts. 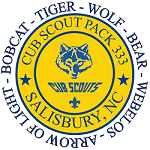 Click Here for a list of Badges and their requirements (US Scouting Service Project).